Background: Mactra veneriformis, a typical marine bivalve mollusk, delicious sea food while low cost, is ubiquitous and abundant in Chinese coastal areas, especially in the coastal shoals of Jiangsu province. To our knowledge, previously reported analytical methods can not meet a set of quality control. Objective: For the simultaneous determination of eight components (uridine, inosine, guanosine, thymidine, adenosine, xanthine, thymine and hypoxanthine) in M. veneriformis, a high performance liquid chromatography with UV detector method was established. Materials and Methods: To develop the method, a reverse phase column, BioBasic-C 18 (5 μm, 4.6 mm × 250 mm) was used. The mobile phase consisted of methanol and water using a gradient elution. The UV wavelength was set at 245 nm. The analysis conditions including extraction methods, extraction solvents, and HPLC parameters were optimized systematically for achieving good separation. Linearity, accuracy, repeatability and detection limit was revealed and showed good performance. Results: The optimized HPLC method was successfully applied for the qualititation of 5 nucleosides namely, uridine, inosine, guanosine, thymidine, adenosine and 3 nucleobases namely, xanthine, thymine, hypoxanthine in M. veneriformis. Conclusion: A method with less time-consuming, more sensitive, and more precise was developed for the quantitative determination of nucleosides and nucleobases in M. veneriformis extractions. The established method might apply as an alternative approach for the quality assessment of M. veneriformis. 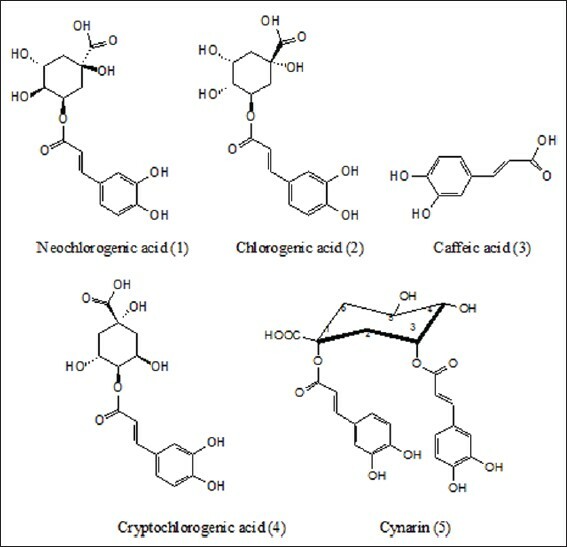 Background: To establish a ultra-pressure liquid chromatography (UPLC) method for the determination of 5 phenolic acids including neochlorogenic acid, chlorogenic acid, caffeic acid, cryptochlorogenic acid, and cynarin in fried Fructus xanthii from different production sites and its dispensing granule. Materials and Methods: An Acquity BEH C 18 chromatographic column (100 mm × 2.1 mm,1.7 μm) was used to perform the determination, which was maintained at 40°C throughout the analysis. Mobile phase was composed of methanol and water containing 0.1% phosphoric acid (v/v) with flow rate at 0.4 mL/min under gradient elution, and detection wavelength was set to 325 nm for monitoring the separation. Results: Neochlorogenic acid, chlorogenic acid, caffeic acid, cryptochlorogenic acid, and cynarin have shown good linearity (r2≥0.9997) within 0.959-239.75, 0.9408-235.2, 0.1638-40.95, 0.6744-67.44, and 0.47-117.5 μg/mL, and their average recoveries were 100.09%, 99.98%, 101.74%, 99.83%, and 99.63%, respectively. Conclusion: The UPLC method established in this study was rapid, and of good accuracy, repeatability and resolution, and hence can assist in the control quality of fried Fructus xanthii as well as its dispensing granule in an efficient manner. Background: Amorpha fruticosa L. and Phytolacca americana L. are native plants for North America, but invasive for Central Europe and the Mediterranean areas. Previous investigation reported DPPH radical scavenging activity of A. fruticosa seeds from Mississippi river basin and P. americana berries from Iran. The aim of the present study was to investigate methanol extracts from leaves and fruits of these invasive species growing in Bulgaria for radical scavenging and acetylcholinesterase inhibitory potential. Materials and Methods: Antioxidant activity was investigated using DPPH and ABTS free radicals; FRAP assay and inhibition of lipid peroxidation in linoleic acid system by FTC. Modified Ellman's colorimetric method was carried out to quantify acetylcholinesterase inhibition potential. 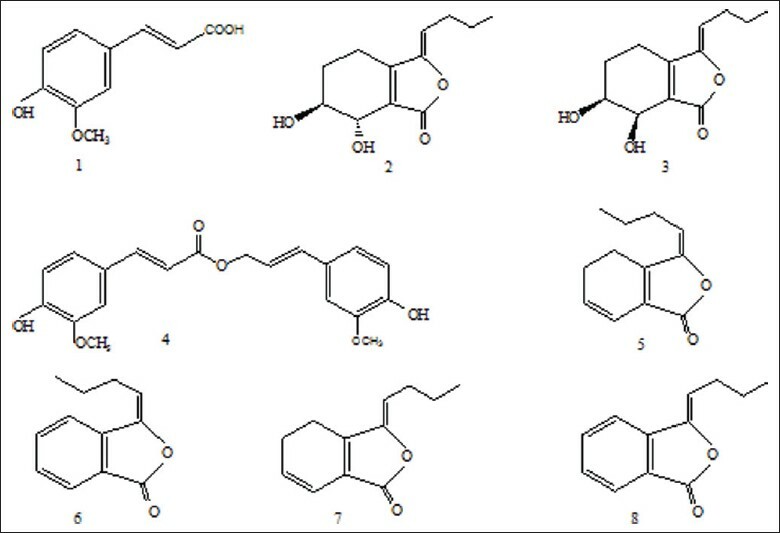 In addition, the quantities of total polyphenols, flavonoids, and hydroxycinnamic derivatives were determinated using Folin-Chiocalteu reagent, AlCl 3 , and Na 2 MoO 4 , respectively. Results: The highest concentrations of total polyphenols and flavonoids were found in A. fruticosa leaves (786.70±1.78 mg/g dry extract and 32.19±0.29 mg/g dry extract, respectively). A. fruticosa fruit was found to be the most enriched in total hydroxycinnamic derivatives (153.55±1.11 mg/g dry extract) and demonstrated the highest antioxidant activity: DPPH, IC 50 9.83 μg/mL; ABTS, IC 50 2.90 μg/mL; FRAP , 642.95±3.95 μg TE/mg de, and acetylcholinesterase inhibitory activity, 48.86±0.55% (2 mg/mL). Conclusions: Phytolacca americana leaves and Amorpha fruticosa could be useful in therapy of free radical pathologies and neurodegenerative disorders. Background: Angelica sinensis is a famous traditional Chinese medicinalherb, which is predominantly used in the treatment of gynecological conditions.It is the first report for the simultaneous determination of six major active components in Chinese Angelica, which is important for quality control. Objective: A validated HPLC-PAD method was first developed to evaluate the quality of crude and processed Radix Angelica through simultaneous determination of six bioactive compounds, namely ferulic acid, senkyunolide I, senkyunolide H, coniferyl ferulate, Z/E-ligustilide and Z/E-butylidenephthalide. Materials and Methods: Samples were separated on a Xtimate™C 18 column (250 × 4.6 mm, 5 μm) and detected by PAD. Mobile phase was composed of (A) aqueous phosphoric acid (0.02%, v/v) and (B) acetonitrile (MeCN) (including 10% tetrahydrofuran, v/v) using a gradient elution. Analytes were performed at 30°C with a flow rate of 1.0 mL/min. Results: All calibration curves showed good linear regression (r 2 ≥ 0.9963) within the tested ranges, and the recovery of the method was in the range of 91.927-105.859%. Conclusion: The results demonstrate that the developed method is accurate and reproducible and could be readily utilized as a suitable quality control method for the quantification of Radix Angelica. Background: This research is among the few that has been conducted on the feasibility of subcritical water extraction (SWE) as a rapid and efficient extraction tool for polysaccharides. Objective: The aim of the study was to extractand optimize the parameter conditions of SWE of polysaccharides from Grifola frondosa using response surface methodology. Materials and Methods: In the study, SWEwas applied to extractbioactive compounds from G. frondosa. A preliminary analysis was made on the physical properties and content determination of extracts using SWE and hot water extraction (HWE). Analysis of the sample residues and antioxidant activities of the polysaccharides extracted by SWE and HWE were then evaluated. Results: The optimal extraction conditions include: extraction temperature of 210°C, extraction time of 43.65 min and the ratio of water to raw material of 26.15:1. Under these optimal conditions, the experimental yield of the polysaccharides (25.1 ± 0.3%) corresponded with the mean value predicted by the model and two times more than the mean value obtained by the traditional HWE. The antioxidant activities of polysaccharides extracted by SWE were generally higher than those extracted by HWE.From the study, the SWE technology could be a time-saving, high yield, and bioactive technique for production of polysaccharides. Background: Ficus racemosa Linn. (Moraceae) bark is a rich source of phenolic compounds known to possess potential antioxidant activity offering numerous health benefits. Materials and Methods: The present study evaluated the protective effects of sequential acetone extract of Ficus racemosa bark at two doses (FR 250 ; 250 mg kg -1 and FR 500 ; 500 mg kg -1 p.o.) against doxorubicin-induced renal and testicular toxicity in rats. Results: Doxorubicin administration resulted in significant decrease (P ≤ 0.05) in total protein and glutathione concentrations, while increased (P ≤ 0.05) serum urea, creatinine and thiobarbituric acid reactive substances (TBARS). Extract pretreatment restored biochemical parameters toward normalization. FR 250 and FR 500 decreased serum creatinine levels by 22.5% and 44%, while serum urea levels were decreased by 30.4% and 58.8%, respectively. Extract pretreatment (500 mg kg -1 ) decreased TBARS and increased glutathione levels in the kidney and testis to control levels. These observations were substantiated by histopathological studies, wherein normal renal and testicular architecture was restored in FR500 group. 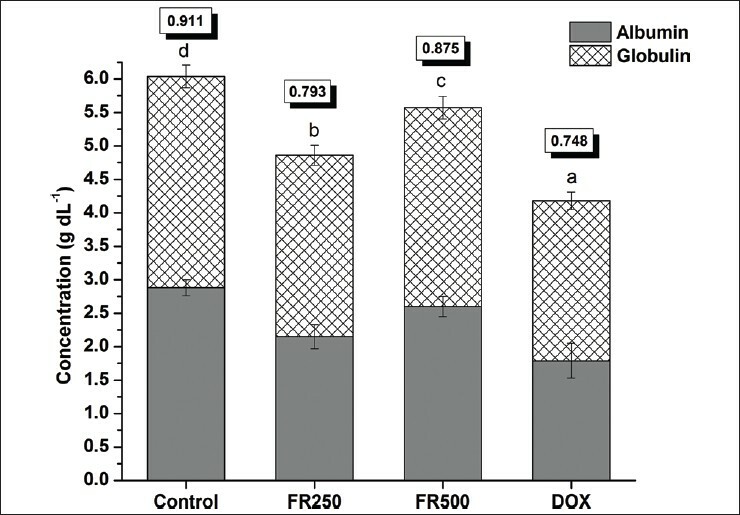 Conclusion: Doxorubicin exposure results in pronounced oxidative stress, and administration of F. racemosa stem bark extract offers significant renal and testicular protection by inhibiting lipidperoxidation-mediated through scavenging free radicals. 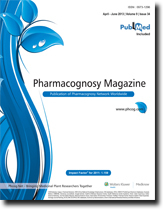 A new long chain fatty alcohol acetate identified as 17-hydroxypentacosanyl acetate, (1) together with a new xanthone identified as 1,8-Dihydroxy-3,6-dimethoxy-xanthone-5-O-[α-L-rhamnopyranosyl-(1''→2')]-β-D-glucopyranoside (3) , as well as two new lignans identified as (+)-Lyoniresinol-3a-O-[α-L-rhamnopyranosyl-(1'''→6'')]-β-D-glucopyranoside (4) and (+)-Isolariciresinol-3a-O-[α-L-rhamnopyranosyl-(1'''→2'')-α-L-rhamnopyranosyl-(1''''→6'')]-β-D-glucopyranoside (5) , in addition to β-sitosterol-3-O-acetate (2) were isolated from the methanolic extract of the aerial parts of Polygonum bellardii growing in Egypt. Their structures were elucidated on the basis of different chemical and spectroscopic evidences. The total extract and its fractions, in addition to compounds (3, 4 and 5) showed significant antioxidant potential by DPPH• scavenging activity technique. Background: Isolation and structure elucidation of flavan-3-ol constituents from the leaves of Ficus spragueana and their cytotoxic activity. Materials and Methods: Different open silica gel column chromatographic techniques with different solvent systems were used for the separation of the constituents of the ethyl acetate-soluble fraction of the alcoholic extract of Ficus spragueana leaves. The structures of these compounds were assigned on the basis of spectroscopic analyses and comparison with literature data. MTT colorimetric assay method (Viability assay) was used for the evaluation of cytotoxic activity of compound 1 against human breast cancer (MCF-7) and human liver cancer (HepG2) cell lines. 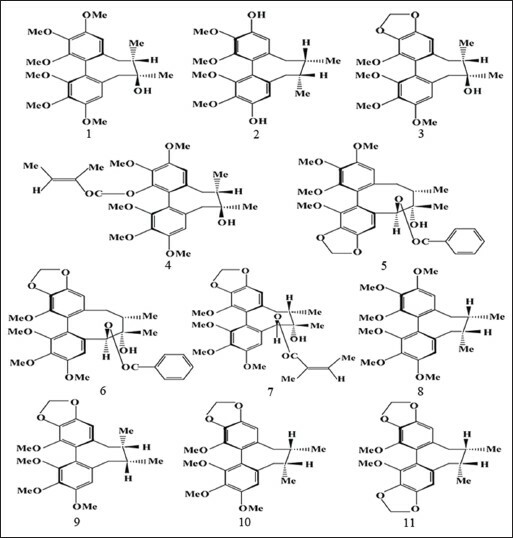 Results: The isolation of one flavan-3-ol dimer and was identified as (-)-afzelechin-(4α→8)-epicatechin 1, and two flavan-3-ol monomers and were identified as (-)-epiafzelechin 2 and (-)-epicatechin 3. Compound 1 was relatively inactive against human breast cancer (MCF-7) cell line at the tested concentrations as compared with the standard. However, at a concentration (50 ΅g) it was found to give inhibition upon the proliferation of examined human liver (HepG2) tumor cell line. Conclusions: Compound 1 is a new flavan-3-ol dimer and it showed a potent cytotoxic activity against human liver (HepG2) tumor cell line. Background: That nimodipine (NMD) is potentially useful for ophthalmic treatment. However, the effect of NMD is unknown on retinal degenerative diseases. Objective: The purpose of the present study was to investigate the effect of NMD on N-methyl-N-nitrosourea (MNU)-induced retinal degeneration (RD) and elucidate its possible mechanisms. Materials and Methods: Morphological observation of NMD on MNU-induced RD was evaluated by light microscopy and electron microscopy. Nonenzymatic antioxidant glutathione (GSH) was measured by a colorimetric method. Transforming growth factor-beta (TGF-β) was measured by enzyme-linked immunosorbent assay (ELISA). Telomerase was detected by reverse transcriptase polymerase chain reaction (RT-PCR). 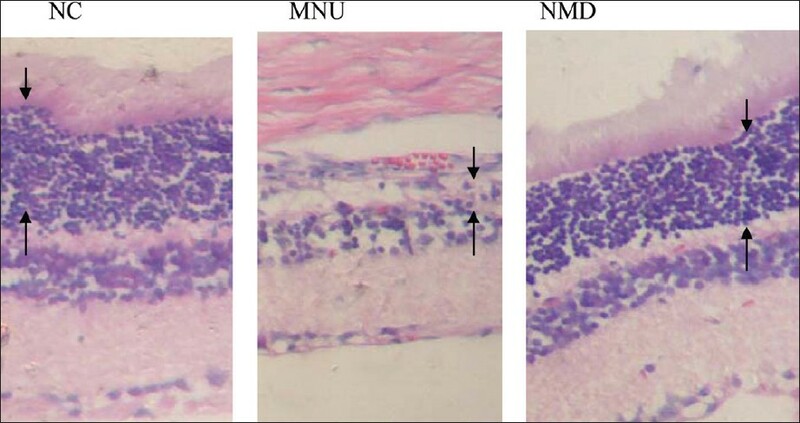 Results: The significantly protective effect of NMD on MNU-induced RD was demonstrated morphologically. NMD increased the content of GSH and decreased the level of TGF-β in rat retina. RT-PCR analysis demonstrated that NMD treatment significantly decreased mRNA level of telomerase. Conclusion: These data suggest that NMD inhibit MNU-induced RD in rats. The expressions of TGF-β, telomerase and GSH contents might partially contribute to its protective effects on MNU-induced RD. Background: Schisandra chinensis, one of the well-known traditional Chinese herbal medicines, is derived from the dry ripe fruits of Schisandra chinensis (Turcz.) Baill. according to the 9th China Pharmacopeia. Lignans are the main components isolated from extracts of S. chinensis and their content varies depending on where S. chinensis was collected. We have established a qualitative and quantitative method based on the bioactive lignans for control of the quality of S. chinensis from different sources. Materials and Methods: To develop a high-performance liquid chromatography method, an Elite ODS C18 column (250 mm Χ 4.6 mm, 5μm) at a column temperature of 30°C and flow rate of 1.0ml/min using acetonitrile (A) and water (B) as the mobile phase with a linear gradient and the peaks were monitored at 217 nm. Results: All calibration curves showed good linearity (r ≥ 0.9995) within test ranges. This method showed good repeatability for the quantification of these eleven components in S. chinensis with intra- and inter-day relative standard deviations less than 0.43% and 1.21%, respectively. In the recovery test, results of accuracy ranged from 99.51% to 101.31% with RSD values less than 2.68%, Conclusion: The validated method can be successfully applied to quantify the eleven investigated components in 22 samples of S. chinensis from different sources. Background: The Tuirejieduling granule is a compound preparation made from four kinds of Chinese medicines. It is effective for anti-inflammation, antivirus, defervescence and anti-bacterium; however, its quality control standards have remained unknown. Objective: To establish a simple and accurate fingerprint method for quality control of the Tuirejieduling granule. Materials and Methods: The methanol extract of the Tuirejieduling granule was used for the fingerprint analysis and the four selected active ingredients (epigoitrin, phillyrin, saikosaponin A and glycyrrhetinic acid) in the extract were determined. The fingerprint method was performed on an Amethyst C18-P chromatography column by gradient elution with acetonitrile and aqueous phase (containing 0.5% H 3 PO 4 (v/v), pH 3.0). Results: Under the optimal chromatographic condition, twenty peaks were chosen as fingerprint peaks of the Tuirejieduling granules extractions. The similarities of 10 batches of Tuirejieduling granule was more than 0.99. This indicates that the different batches of Tuirejieduling granules were under the consistent quality control. Good linear behaviors over the investigated concentration ranges were obtained with the values of R2 higher than 0.99 for four studied active ingredients. The recoveries for spiked samples were in the range of 96.2-105.5%. The developed method was successfully applied to determine the contents of active constituents in different batches of Tuirejieduling granule. Conclusion: The HPLC fingerprint was proved to be a reliable method for the quality control of Tuirejieduling granule. Background: Mushrooms are an important natural source represents a major and untapped potent pharmaceutical product. Ganoderma lucidum (G. lucidum) an important medicinal mushroom has been shown to contain high amount of antioxidant. However, in vivo studies on G. lucidum fruiting bodies are lacking. Objectives: To determine the effects of G. lucidum fruiting bodies ethanolic extract (GLEet) on expression of xenobiotic enzymes, oxidant-antioxidant and hormonal status on 7,12-dimethyl benz[a]antheracene (DMBA) induced experimental breast cancer was investigated in female Sprague dawley rats. Materials and Methods: Cancer bearing female Sprague dawley rats was orally treated with GLEet (500mg/kg body weight) for 16 weeks. Incidence and tumor volume in each groups, and biochemical parameters were carried out in plasma, liver, and mammary tissues of animals. Histopathological and immunohistochemical analysis were also determined. Result: Oral administration of GLEet on tumor bearing animals significantly diminished the levels of lipid peroxidation thereby enhancing the nonenzymatic antioxidants and also positively regulated the estrogen receptor hormones level to near normal when compared with DMBA treated rats. Moreover, it also positively modulates the xenobiotic metabolizing enzymes. Therefore, the dietary administration of G. lucidum may be efficiently used as a chemopreventive agent against mammary carcinogenesis. Conclusion: We concluded that G. lucidum is a potent chemopreventive agent, thereby it offers maximum protection against DMBA-induced mammary carcinogenesis. Background: Vedic Guard is a polyherbal formulation used in the treatment of various ailments, however, is not scientifically assessed for its effect on doxorubicin-induced cardiotoxicity. Objective: To find out the preventive role of Vedic Guard against doxorubicin-induced myocardial toxicity in rats. 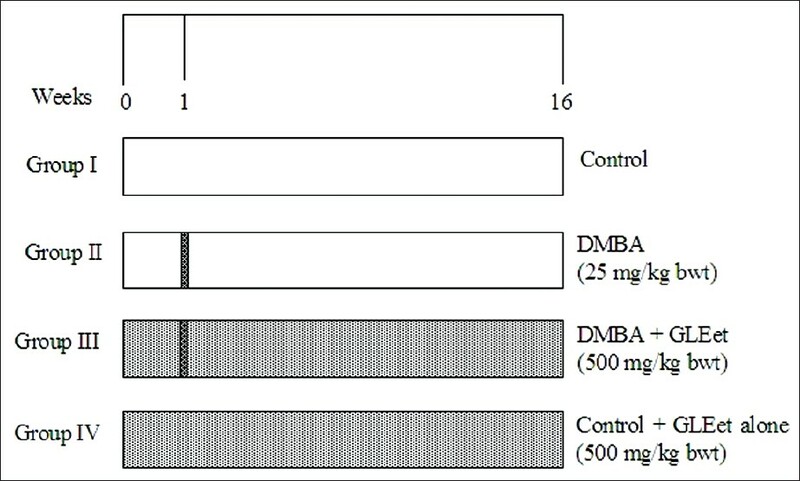 Materials and Methods: Cardiotoxicity was produced by doxorubicin (15 mg/kg for 2 weeks). Vedic Guard (270 mg/kg, orally) was administered as pre-treatment for 2 weeks and then for 2 weeks alternated with doxorubicin (DXR). The general observations, mortality, histopathology, biomarker like lactate dehydrogenase (LDH), creatine phosphokinase (CPK), aspartate aminotransferase (AST), alanine transaminase (ALT), electrocardiographic (ECG) parameters, antioxidants such as glutathione (GSH), superoxide dismutase (SOD), and catalase (CAT) were monitored after 3 weeks of last dose. Results: The repeated administration of DXR causes cardiomyopathy associated with an antioxidant deficit. 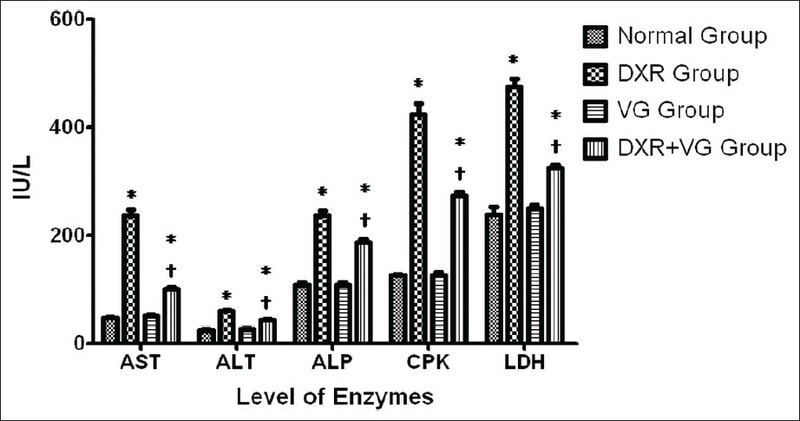 Pre-treatment with Vedic Guard decreases serum enzyme viz LDH, CPK, AST, and ALT levels to that of normal values. Vedic Guard significantly protected the myocardium from the toxic effect of DXR, by increasing the levels of antioxidants such as GSH, SOD, and CAT and decreased the elevated level of malondialdehyde. The study shows significant alteration of ECG pattern in DXR administered rats. The characteristic findings were elevation of ST segment, reduction in P waves, QRS complex, and R-R interval. Vedic Guard showed a protective effect against DXR-induced altered ECG pattern. It also reduced the severity of cellular damage of the myocardium confirmed by histopathology. Conclusion: The results of the present study indicated c ardioprotective effect of Vedic Guard might be attributed to its antioxidant activity. Background: Panax ginseng C. A. Meyer, a perennial herb from the Araliaceae family, is a commonly used medicinal plant. Many studies have been conducted on the biologically active constituents of whole parts of P. ginseng (i.e., roots, leaves, flower buds, and fruits). However, the seeds of P. ginseng have not been intensively investigated. A new sterol glucoside,3-O-β-d-glucopyranosyl-5,22,24-stigmastatrienol ( 1 ), and a known sterol, 5,22-stigmastadienol ( 2 ),were isolated from seeds of P. ginsengand were evaluated for their inhibitory activities on tumor necrosis factor (TNF)α-induced nuclear factor (NF)-κB and inducible nitric oxide synthase (iNOS) transcription in transfected HepG2 cells. The present work deals with the isolation, identification, and antiinflammatory activities of the two compounds. 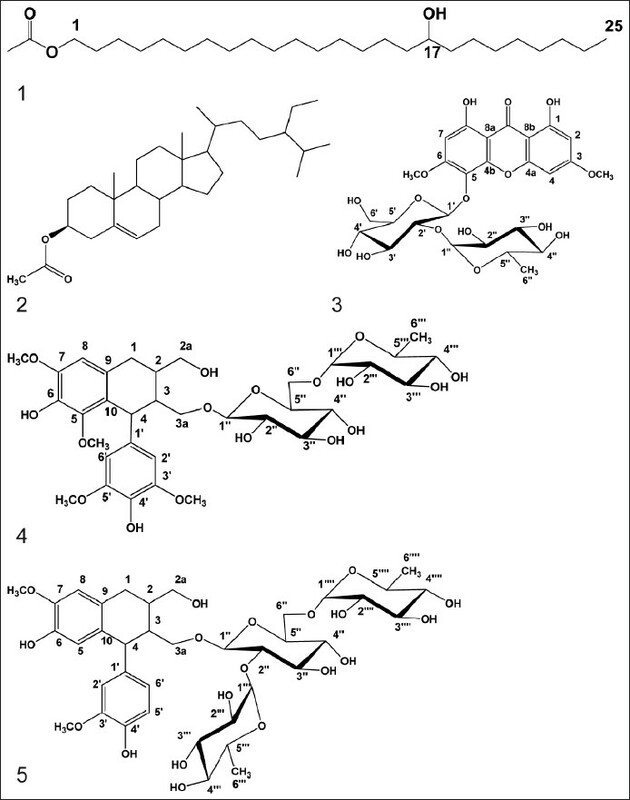 Materials and Methods: The compounds were isolated by a combination of silica gel and YMC R-18 column chromatography, and their structures were identified by analysis of spectroscopic data (1D, 2D-NMR, and MS).The antiinflammatory activities of the isolated compounds 1 and 2 were evaluated by luciferase reporter gene assays. 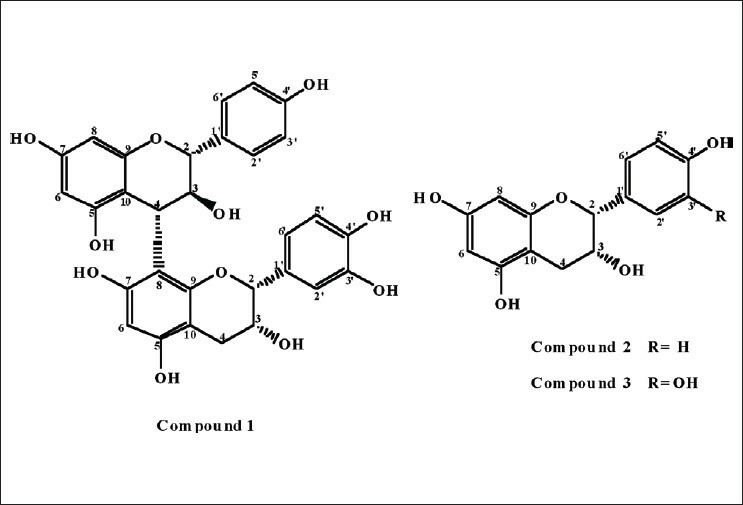 Results: Two sterols have been isolated from the seeds of P. ginseng. Compound 1 is a previously unreported glucosidyl sterol. Compounds 1 and 2 both inhibited NFκB-luciferase activity, with IC 50 values of 8.1 and 4.8΅M, respectively. They also inhibited iNOS-luciferase activity in TNFα-induced HepG2 cells, with IC 50 values of 2.2 and 2.9΅M, respectively. Conclusion: The two isolatedsterols have inhibitory effects on inflammation-related factors in HepG2 cells, as determined by luciferase reporter gene assays. Thus, seeds of P. ginseng are worthy of consideration for the development and research of antiinflammatory agents.